Are These the Tech Specs of the Google Smartwatch? Rumors about a coming smartwatch from Google were fortified this week when The Wall Street Journal reported that Google was, in fact, working on an Android-powered wristwatch, according to people familiar with the matter. When the Journal starts talking about matters about which people are familiar, you can assume they’re reporting something more solid than rumor. We can move the Google smartwatch likelihood needle up to 95% at this point. As a heavy user of Google services, I really want a great, Google-centric smartwatch. But what would such a watch do? I have a theory. And if my theory is correct, then we should be able to speculate about what the watch’s actual specifications, functionality and user interface will be. Google believes in the vision of Google Glass. The idea is to make the Internet and social connections more immediate and seamless by making them part of us. Rather than being with us, Glass is literally on us and part of us. It’s wearable computing, obviously, but every aspect of the interface is Google-centric. You use the Google Knowledge Base, Google+, Hangouts and other Google services to interact with online information and also the people you know. You also use Glass to take pictures and videos without having to fumble with a camera or smartphone. In the development of Glass, Google engineers and designers are exploring and inventing how a person might want to use a wearable device. They don’t give a giant screen, but a tiny one. They don’t give you a million options, just a few. The input is voice or touch and the output is words, sounds and simply symbols. You can communicate with people by sending a message or launching a video hangout. All this intelligent thinking about how a personal might interact with a wearable computing device applies to a watch as well as Glass. So that’s my theory: That Google will replicate the Glass experience in a watch. The idea that the Google Watch is just “Google Glass for your wrist” is not new. But if that’s true, what would that actually mean for the device, specifically? If my theory is right, Google’s Android watch could have a 640×360 screen, just like Glass does. 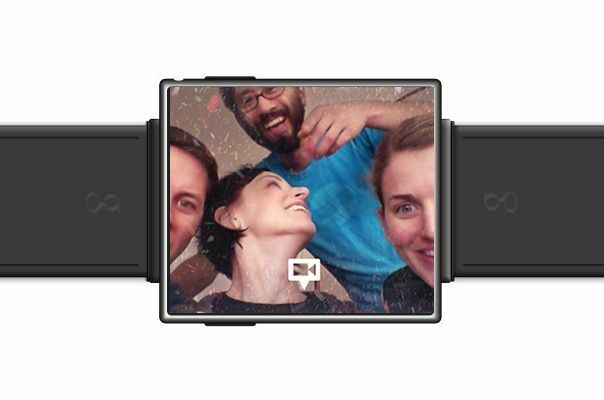 That’s a very high pixel density compared with other smartwatches on the market. An alternative is that they cut the resolution in half and make it 320×180. Either way, the watch should be rectangular, rather than circular or square. Like Google Glass, it would have a 5-megapixel camera that can record video at 720p. Unlike many camera watches, which often have the camera mounted on the side or edge of the watch, the Google Glass camera would be front-facing. It would auto-adjust so that the picture or video would take right-side up. It would know which side is up because, like Glass, it would have a gyroscope. To take a picture or video of something in front of you, you would hold up your arm so that your palm was facing you and say, “OK, Watch: Take a picture.” To take a selfie or do a video Hangout, you would hold your arm up with palm facing away from you. Unlike the camera watches with the cameras on the edge, which are often sold as “spy” watches, the front-facing orientation of the lens in the watch would make it obvious when somebody is taking a picture. The watch face would have to be pointed directly at the subject and held there for a few seconds while the wearer commanded the snapshot. The watch would support not only Bluetooth for connecting to a smartphone, it would also support WiFi. The watch would have 16 GB of storage and 682 MB of RAM. It would also feature a light sensor for dimming or brightening the screen. Google Glass uses bone conduction for sound. This wouldn’t make sense for a Google Watch, so it would probably have a tiny speaker and/or an earbud jack. Another feature that would make a lot of sense in a Google Watch would be a vibration alert feature, to buzz you when you’ve got an incoming alert. Just like Google Glass, the purpose of the Google Watch would be not to augment reality but to augment you with more immediately available capabilities for photographic memory and instant communication. The watch would alert you to incoming texts and caller ID information for incoming calls. It would pop up contextual information via Google Now on occasion. And Google Now would be conjured up just like on smartphone. You touch the screen or say “OK, Watch: How late is Starbucks open?” and the answer would come to you. The Google Watch should give you walking turn-by-turn directions, with arrows telling you which way to go. You would also use your voice to set reminders and appointments, send texts and emails and launch Hangouts. If my theory is right, the Google Watch would tap into the same back-end software and service functionality being built for Google Glass, and offer most of the same benefits. It would sacrifice some immediacy — a screen on your wrist is not quite as immediate as a screen zapped at your eyeball — but you would gain subtlety — instead of having a cyborg device on your face, you would just be wearing a wristwatch. It’s possible that because Google Watch taps into the same intense work being done for Google Glass that it could be the best watch of all — it’s relative quality being determined by the relative Quality of Google services vs competing services. For example, it won’t be easy for the other watch makers — which could include Microsoft, Apple, Samsung, LG and Intel and a gazillion startups — to match Google Now, especially since Google Now gets smarter as use Search, Gmail, YouTube, Google+ and other Google services on other devices. In short, I don’t think it’s useful to think about Google Glass as an isolated, stand-alone product, but rather think about wearable computing as a service platform, and Google Glass and the Google Watch as the first two devices on that platform. It seems likely that Google will eventually open this platform up to other hardware makers, and that we could see Google Glass functionality showing up on car windshields, in ski masks, on bathroom mirrors and elsewhere, making a transition from wearable computing to ubiquitous computing — detecting your presence brings up YOUR personal virtual assistant on whatever device is nearby. What matters is the algorithmically determined, self-learning marriage of contextual data, personal data and universal data into a super-intimate device that’s on you rather than with you, that’s part of you rather than in your possession. Personally, I’d rather wear the Watch than the Glass. How about you?